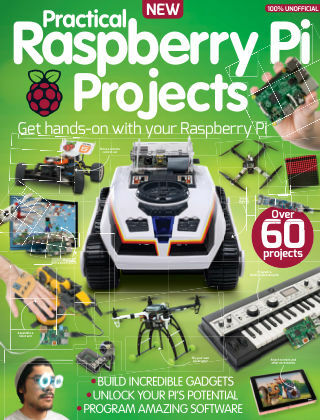 With Readly you can read Practical Raspberry Pi Projects and thousands of other magazines on your tablet and smartphone. Get access to all with just one subscription. New releases and back issues – all included. No matter your age or experience level, there's a Raspberry Pi Project for you, and in Practical Raspberry Pi Projects we're giving you everything you need to fire up your imagination and unleash your creativity. From hardware-based projects like building a Raspberry Pi-controlled car, through software projects like programming your own virtual assistant, all the way to advanced electronics projects that will see you transforming your Pi into a drum machine, car computer or quadcopter, we've got plenty here to keep you busy. Featuring: 10 practical Raspberry Pi projects - Follow along with our expert advice and kick-start your own amazing Raspberry Pi projects. Build a Raspberry Pi car computer - Make your own touchscreen navigation system that gives directions, local weather reports and plays music. Program a Raspberry Pi quadcopter - Code your way into the clouds with this flying RasPi robot. 20 Raspberry Pi hacking projects - Get the inside story on how to replicate the greatest Raspberry Pi hardware hacks.